I watched the police car navigating through traffic with its lights and siren on. There were no “near misses” and no screeching brakes. The siren pitch changed as the squad car approached the multi-lane intersection and slowed almost to a stop. I could see the officer “clearing the lanes” as he verified that all the traffic had stopped. I noted the officer signaled his turn and was wearing his seat belt. The squad car passed through the intersection, increased its speed, and the siren pitch changed back to wail. The same process was repeated at the next intersection. It was smooth, deliberate, and professional. The scene could have been used as a training video for the “Below 100” program. 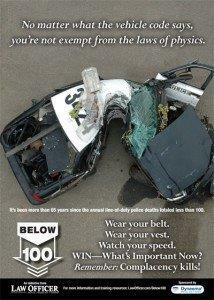 Below 100 is an initiative to get the number of police officer line-of-duty deaths to below 100 per year. The five tenets to the program are: Wear Your Vest, Wear Your Seat Belt, Watch Your Speed, WIN (What’s Important Now), and Complacency Kills. Police driving is at the heart of four of the five tenets. Captain Travis Yates of the Tulsa Oklahoma police department is a Below 100 spokesman. Captain Yates connects the management of squad car speed with the need to treat each intersection as “an environmental change.” He says: “You better adjust to them (the traffic) because they are NOT going to adjust to you.” and “There is no room for error; you cannot make a mistake at an intersection!” Crashes at intersections often result in side-impact collisions, and that type of crash kills citizens and cops. In our last blog we mentioned the California POST Board Safe Driving Campaign video series “Did You Know?” On June 15 one of their training videos entitled “Code 97” won an Emmy Award last week from the National Academy of Television Arts and Sciences. Congratulations to the team working on the venture. Periodically we want to provide you with online training resources, including some multimedia. Many of the videos below would work well for roll call trainings. This is probably not what you think it is. The Minnesota Information Policy Analysis Division (IPAD) of the Department of Administration is hosting a second workshop for law enforcement officials. The June Law Enforcement Data Workshop filled up very quickly, so IPAD will offer a second date in September. The second workshop will be on Wednesday, September 25, 2013, from 9 a.m. - 3:30 p.m. in St. Paul. For more information about the workshop and to register, visit www.ipad.state.mn.us. If you have questions or comments, please contact info.ipad@state.mn.us or (651) 296-6733. The free PATROL (Police Accredited Training Online) web-based course on the ethical use of databases is now live and is getting rave reviews. 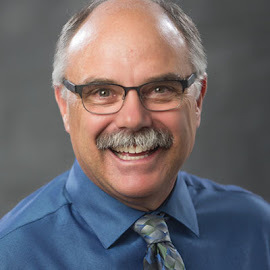 For more information, read my May 20 blog entry or contact the program administrator, Laura Honeck at (651) 281-1280 or lhoneck@lmc.org. Up next...Emergency Driving, High Frequency, and High Risk.